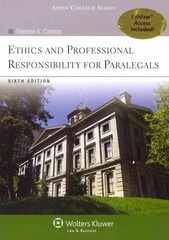 Ethics and Professional Responsibility for Paralegals 6 Edition Ethics and Professional Responsibility for Paralegals provides completecoverage of legal ethics tailored to the needs of the practicing paralegal.Now in its fifth edition, Therese Cannon's authoritative and highly successfultextbook continues to provide paralegal students with invaluable insights intothe ethical principles they will face in practice.Among the attributes that make this text so effective:comprehensive coverage of all the major areas of legal ethics, placingspecial emphasis on how the rules affect paralegalsauthoritative presentation combined with clear and readable text andeffective pedagogy. Each chapter begins with an overview, followed bywell-written text in a well-organized format. Key terms are introduced initalics. Review questions reinforce the material.discussion questions, hypotheticals, research and other outside assignmentsprovide depth and practice in applying the ruleseach chapter includes landmark cases on paralegals and other cases thatdemonstrate how the principles and rules are applieduseful appendicesprovide the text of paralegal association ethics codes that are referencedthroughout the bookthe book iseasily adaptable to courses of different lengths and can beused in other paralegal courses for supplementary ethics coverage across thecurriculumteaching package includes an Instructor's Manual with Test Bank andPowerPoint slidesThe Fifth Edition has been enhanced with:new rules and cases, including changes in ABA Model Rules and new caseson supervision, UPL, confidentiality, conflicts, competence and litigationnew assignments and research projectsmore hypotheticals suitable for use in class discussions or asassignments added to discussion questionsexpanded Instructor's Manual that includes a Test BankWeb site that has links tostate-specific ethics rules, ethics opinions andguidelinesWritten by the highly respected legal educator, Therese Cannon, there is notext comparable to Ethics and Professional Responsibility for Paralegalsfor teaching professional responsibility to paralegal students. *Instructor's Manuals are a professional courtesy offered to professors only.For more information or to request a copy, please contact Wolter's Kluwer Law& Business at 800.529.7545 or examcopy@wolterskluwer.com.